Harry Pleeth, founder member of the Macclesfield Chamber of Commerce and President of the Macclesfield and District Scout Council: born 15 January 1910; married 1933 Lydia (one son, one daughter, two grandsons, three grand daughters, eleven great grand children); died at home in Macclesfield, 18 January 2007. Harry Pleeth was a well known ‘adopted son’ of both Bollington and Macclesfield. He was a founder member of the Macclesfield Chamber of Commerce & Industry, President of the Macclesfield & District Scout Council, District Commissioner for Macclesfield & Congleton Scout Association, Governor of Ryles Park School and Macclesfield College and Director of Cheshire Building Society. The former Works Director of Friedland plc and part-time fire-fighter received the MBE in 1998 for “Services to industry and the Scouting movement”. Harry became interested in Scouting when his son, John, joined the 2nd Bollington Methodist Troop in the early 1950’s. He went on to play an active role in Scouting, rising to become both President of the Macclesfield & District Scout Council and District Commissioner for Macclesfield & Congleton Scout Association. During this time he played a major part in the creation and development of the Barnswood Scout Camp , near Leek, which is still used and enjoyed by Scouts from across the UK and beyond. Harry was also heavily involved with Young Enterprise, and had past links with the Citizens Advice Bureau, Council for Voluntary Services, the Textile Federation and Macclesfield Library Children’s Essay Competition. But he also had a lighter side as, during the war years, he started entertaining people as a comedian when he teamed up with his business colleague and best friend Sid Hartley putting together comedy shows and pantomimes in Bollington and Macclesfield. 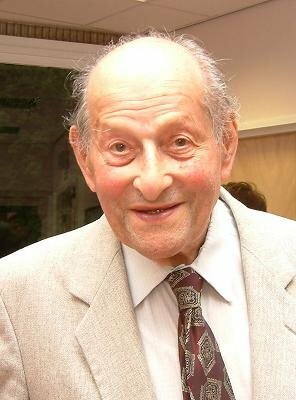 Harry was born in London, youngest son of eight, of Polish émigré parents in 1910. He later worked in the city until 1939 where he was employed by V & E Friedland, a company at that time manufacturing parts for the Army and Airforce. However, that year his factory was bombed during the blitz and the workforce had to relocate very quickly to the first available site which happened to be in Lowerhouse Mill, Bollington. He and his wife Lydia, who he met in London, lived for many happy years in Bollington and Tytherington and raised two children, Barbara and John, before Lydia died in 1992. Harry was active throughout his later years. He worked with the Scouting movement until the age of 89, was involved with Neighbourhood Watch and in 2004 led a community campaign to re-establish a local pathway. In his final years Harry was a familiar figure about the town and recognised by many by his favoured mode of transport, his red motorised scooter. A Funeral Service was held on Tuesday 30th January 2007 at St Michael’s Church, Macclesfield.